With just under 15 minutes left in the day, the clock was paused, and players assumed they would be drawing a number of hands left to play for the day. This was not the case, as a card with blood on it was discovered on one of the outer tables, so security had to be brought in to clean the cards. Preflop action had already occurred, with Tarun G. raising to 5,000 under the gun and getting one caller. Players went on a 15 minute break, and the small blind and big blind who had not acted were two of those players. After the cards had been cleaned, the players returned and the pot continued. 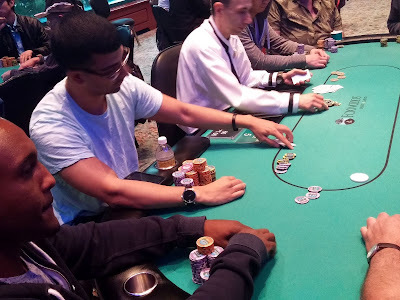 As they returned to the table, both blinds folded, and Tarun bet out on the [Td][3d][Th] flop. His opponent called, and then bet when checked to on the [9c] turn. Tarun called, and then checked again on the [3h] river. His opponent bet 22,500, and Tarun went into the tank. He eventually made the call, and his opponent said, "You got it." Tarun tabled pocket sevens to win the pot and increase his stack to around 140,000. Play continued to the 10 minute mark, and then it was announced that four more hands will be played before players in Flight C will bag up for the night. Meanwhile, Flight D is just about to go on their first break of the day. So far this flight has 360 entries. Cards are in the air for the last of 4 flights for Event #1 $580 NLH. Registration and re-entries are available until Level 9, at which time prize pool and payout information will be released. Cards are in the air for the 3rd of 4 flights in Event #1 $580 NLH. Players begin with 12,000 in chips, and registration and re-entries are open until the 9th level. So far 166 players are entered. This is a three day tournament. Day 2 levels will be 40 and 50. There is no dinner break on Day 1. The day will conclude at approximately 7:30pm. Registration will remain open until the start of level 9 (approximately 9:20pm). There is no dinner break on Day 1. The day will conclude at approximately 1:30am. Play has concluded for the night in Flight B. The survivors will return to combine with all other flights at 12pm on Saturday. A full list of chip counts will be posted shortly. Flight C begins tomorrow at 11am and Flight D is at 5pm.